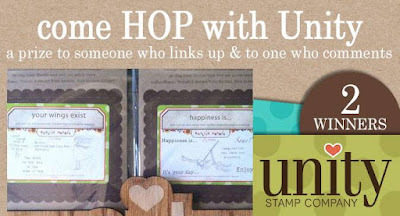 Unity Stamp Company: We are on REPEAT!!!!! - More pretty projects from our NEWEST RELEASE! We are on REPEAT!!!!! - More pretty projects from our NEWEST RELEASE! Come ENJOY a Unity Inspired BLOG HOP with us! We have tons of inspiration from the DT along with some great promotions!! If you SHOPPED LAST WEEK, you are going to want to take a peek at this category again - BECAUSE we have taken all the sale stamps from LAST WEEK OUT and added ALL NEW ITEMS! YOU get a FREE STAMP for every $10 you SPEND! RANDOM - taken from extra inventory HERE AT UNITY!!!! We have changed this little PROMO to 3 for $24! NEW SELECTION - SO MUCH FUN! but we want to see what YOU have created too.